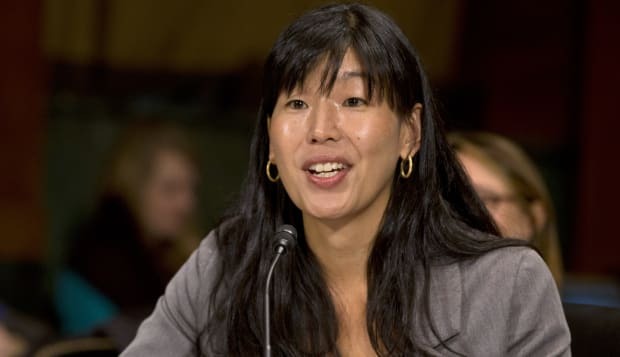 AP Ai-jen Poo testifies at a U.S. Senate hearing on immigrant women, March 18, 2013. Theirs is probably the least-noticed and least-protected legitimate occupation of any practiced in the U.S. but, to quote activist Ai-jen Poo, they are "the women who do the work that makes all other work possible." They are housemaids or nannies, or care-givers for the ailing and the elderly. Overwhelmingly, they are female, immigrants or women of color. Until recently, they were exempt from virtually all federal and state labor laws with the exception, theoretically and only in some cases, of the minimum wage. Laws that limit the number of hours an employee can be required to work. Laws that protect employees from harassment , racial discrimination and work hazards. Laws requiring minimum standards of living for resident employees. Domestic workers were specifically excluded from the Civil Rights Act of 1964, the National Labor Relations Act and the Occupational Safety and Health Act. That is beginning to change, largely due to the efforts of one woman who, for 16 years, has juggled a bewildering array of executive titles for non-profit organizations that work to improve the working and living conditions of domestic workers. This week, Ai-jen Poo was rewarded with a "genius" grant from the MacArthur Foundation. She says she will use the $625,000 fellowship award to further her work as executive director of the National Domestic Workers Alliance. After years of partisan debate, the federal labor regulations are being tweaked to extend overtime pay rights to direct care workers who are employed by a third-party agency. A new California law extends overtime pay to domestic workers. Massachusetts now extends maternity leave protection to domestic workers, and requires due cause for firing. All of the above have been hailed as landmarks, though most Americans probably were unaware just how unprotected this workforce has been by modern labor laws. They may get more familiar with the domestic workers' world in the not-too-distant future. The sheer numbers of domestic workers and caregivers has been growing for decades, as more wives enter the workforce full-time. There are now somewhere between one and two million of them, depending on how they are counted. But now, the need for outside help is growing, along with the attention being focused on the plight of the "sandwich generation," those adults from early to late middle-age who are juggling responsibilities for both their children and their elderly parents. According to a 2013 study by Pew Research, nearly half of adults in their 40s and 50s have both a parent and a child that may need financial or emotional support or, eventually, caregiving. It remains to be seen whether they find the improving conditions of domestic workers to be a benefit or just one more burden to bear. Naturally, Ai-jen Poo has a plan for that, too. In 2011, she created Caring Across Generations, an organization dedicated to creating the systems and supports necessary for care of the elderly.